The first response is from Virginie Mercier of the French- based anti-abortion campaign March for Life. “The issue of abortion is not only about women’s rights but it’s about the right of the unborn child. The child in utero already has his/her own freedom, his/her own body and his/her freedom to live,’‘ Mercier said. “So, I think that this is not only a question of women’s rights and in that respect, the Spanish reform project is far from being a step back. On the contrary it really is progress for humanity because it’s about the recognition of the humanity of the child conceived in utero. “Any scientist will tell you that there is life right from conception. Our group is campaigning for zero abortion, because as soon as there is a human life, it’s not acceptable to recognise the right to take human life. We are asking the French government to put in place a real policy to foster and to help pregnant women in need that differs from the current systematic recourse to abortion. 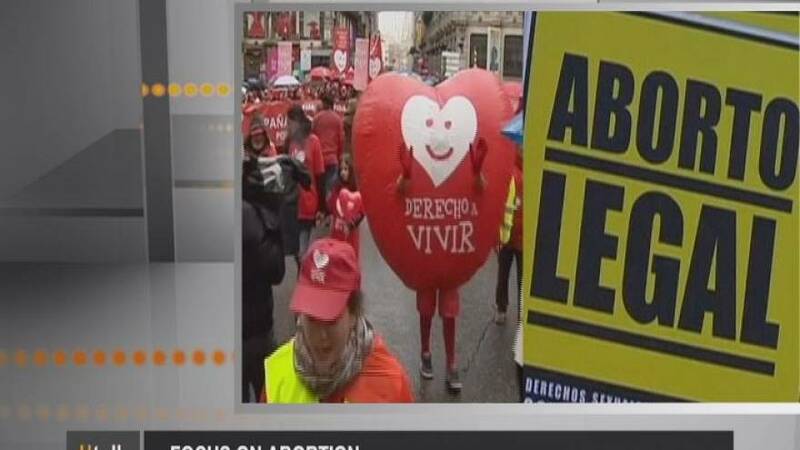 “So, we’re seeking the abrogation of the current French law on abortion and we demand new measures for the welfare of children,” Mercier concluded. Countering those arguments Viviane Teitelbaum, president of the European Women’s Lobby said: “Today the issue of sexual and reproductive rights and therefore in that context, the right to abortion is a democratic issue. “For me it goes far beyond the choice of women as it relates to democratic values…… and the very concept of gender equality. Therefore the right to abortion should remain a choice. The proposed reform of the law in Spain is a step back, it’s not a small step back, this is a very significant step back. In the meantime, the European Parliament has decided that abortion should remain an issue for national governments and the EP will not legislate on this issue. “An embryo of a few weeks is not a child who chooses to live or not. There’s no question about that. But we do believe that we must protect life and to do so, we have to start by protecting the lives of those who already live. “And this should lead us to think about the importance of sexual and emotional education. We have to think about contraception as well. Of course, this is not an easy choice that’s why women have to b healthy and in good physical condition, they have to be supported in their choices. That’s what we want,” Teitelbaum said. If you would also like to ask a question on U-talk, click on the button below.